We offer Group Yoga Classes for all levels, everyday. Drop-ins are welcome. Mats are available for use. All Weekly Group Classes are 1 hour; Restorative Yoga on 1st & 3rd Friday nights is 90 minutes. Workshops and Series class length will vary. All levels (including beginners) are welcome to attend this well-rounded yoga class. It begins with a centering meditation, then moves into a physical warm-up to prepare for a varied asana (pose) sequence. It may include Pranayama (breathing techniques), Kriya (energy balancing) techniques, mantra (sound), mudras (hand gestures), and/or Restorative Yoga poses. It will culminate with a deep Savasana (resting pose) with optional aromatherapy. $15 (M/W/F 8am); (M/W 5:30pm); (Sat. 9am). Put some sand in your practice and enjoy a yoga class on the beach! All Levels Welcome. Please meet at Whale Park (corner of 3rd & Hemlock), across the street and just North of the studio. Mats will not be provided. Please bring a beach towel to practice on and anything else that you need to sit comfortably. Please dress in layers. Class is weather dependent. $15 (Sun 11:30am). This gentle yoga class is practiced while seated or using a chair for support. The modified Hatha Yoga postures are designed to build strength and flexibility and improve circulation through movement that is linked with the breath. Recommended for beginners, those new to yoga or anyone who is challenged by getting up and down off the floor. $15(M/W/F 9:30am). Open to all students endeavoring to find a therapeutic relationship with Yoga. Self-massage techniques, low-intensity vinyasa asana (poses) and restorative poses will help each individual discover their personal Yogic needs. We will focus on using Yoga as a tool to balance energetically and physically. 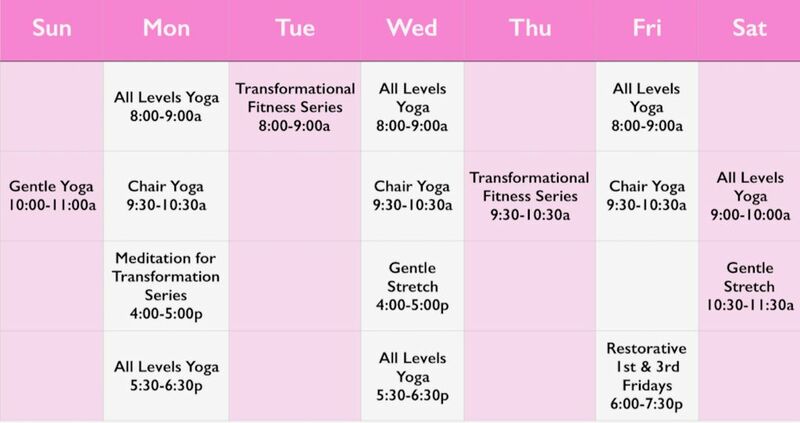 Classes may also touch upon Chakra theory, Reflexology, Thai Yoga Therapy, and Pranayama among other practices. Students are encouraged to come with questions or themes that interest them, but most importantly a "Beginner's mind." $15 (Sun.10am). This class explores meditation through the lens of Kriya (actions to purify) techniques. The techniques may include Mantra, Mudra and visualization to balance and sense the energetic channels or meridians. Expect some gentle movements, stretching and pranayama (breathing techniques) to prepare to sit for meditation. All Levels are Welcome. $15 (Mon. 4:00pm). Restorative yoga is active relaxation. Reclined positions supported with bolsters & pillows stimulate and relax the body, moving it toward balance. No experience necessary, available to most fitness levels. Class size is limited to 10, preregistration is recommended. $20 (1st & 3rd Fridays of the month, 6:00-7:30pm). This all levels class is designed to cultivate strength and balance to transform, shape and move energy more efficiently and effectively. The routines will draw from yoga, pilates and barre techniques. Come to move, breathe, stretch and sweat in a way that leaves you feeling energized and strong. All levels welcome. $15 (Tues. 8:00am, Thurs. 9:30am). Sign-up online or see any changes to the schedule by clicking the Schedule.